Missouri Divorce Law - What is a Parenting Plan? Call & Gentry Law Group will be YOUR law firm providing responsive, dedicated and personalized results. Our attorneys obtained the 2nd largest settlement in the entire state of Missouri in 2016. 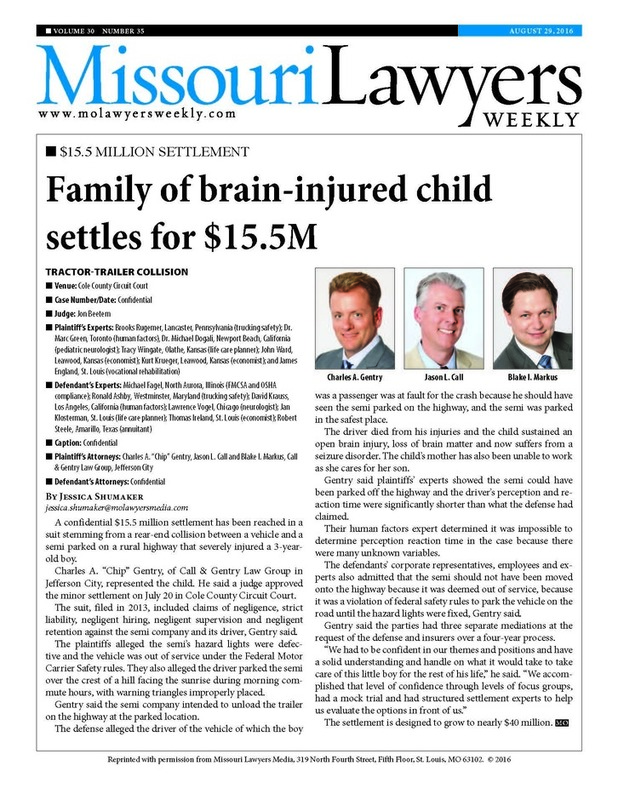 Read the full story as published in Missouri Lawyers Weekly here. Many thanks to our clients and friends for voting us one of Jefferson City's best law firms! We have worked hard to earn a Superb Rating from Avvo, one of the leading sources to find your lawyer! Under Missouri law, the courts in custody cases are required to adopt a parenting plan that the court finds is in the best interest of the child or children of the parties. If the parties agree upon a written parenting plan, the court will adopt this parenting plan so long as the court agrees it is in the best interest of the child or children. If the parties do not agree upon a plan, each party should submit his or her proposed parenting plan to the court for consideration. The court will then either adopt a plan of one of the parties or, if the court doesn’t believe either plan is in the child’s or children’s best interest, it will reject both parents’ plans and adopt a plan crafted by the court. There are a number of factors set out in RSMo. § 452.375 that the court must consider when it chooses a plan. The terms of the parenting plan adopted by the court become incorporated into the terms of the judgment and are enforceable just as any other term of the judgment is enforceable. A violation of the terms of a parenting plan is a violation of the court’s judgment. The violating party can be found in contempt of court and subject to sanctions including compensatory custody time, monetary penalties or even jail time. There are two different kinds of custody that are covered by a parenting plan: legal custody and physical custody. The preference in Missouri, is for both joint legal custody and joint physical custody. While joint legal and joint physical are the preference, this means they are just the starting point for the court’s consideration. In some cases, the court will enter an order of sole legal custody and/or sole physical custody. The court will consider each case on its unique facts and determine what is best for that child or those children. Legal custody refers to the decision-making rights with regard to the child or children: medical procedures, medications, religious upbringing, extracurricular activities, educational endeavors etc. Joint legal custody requires both parents to discuss and agree upon any decision pertaining to the welfare of the child or children. Neither parent is permitted to unilaterally make any decision related to the health, education or general welfare of the child or children. In rare circumstances, the court will enter an order of sole legal custody to one parent. This might be appropriate were one parent is incapable of assisting in the decision-making process or where the parents simply cannot put aside their antipathy and jointly make decisions. Sole legal custody granted to one parent, enables that parent to make these decisions without any prior discussion or agreement between the parents. In a case where the court does grant sole legal custody, the court will oftentimes still require the sole legal custodian to keep the other parent informed about the decisions being made. Physical custody is the schedule the parents will follow for the custodial time. Joint physical custody does not necessarily mean equal time with the children. Joint physical custody is a plan that includes significant time with both parents. An example of a joint physical custody plan would be a schedule that alternates weekly. This is an equal custody schedule. Another example of a joint physical custody plan, one that is not an equal plan, is one parent has every other weekend during the school year and the plan flips so that the other parent has every other weekend during the summer. While this second plan is not an equal custody plan, it still provides for significant time with both parents. A plan with sole physical custody means that the sole physical custodian has the great majority of the time with the child or children and the other parent has short periods of visitation. A plan that continues as every other weekend all year long is classified as a sole physical custody plan. Another example of a sole physical custody plan is one where the distance between the parties is so great that one parent is only able to have custody several weeks out of each summer. Beyond legal and physical custody, a parenting plan must also identify one parent’s address for educational purposes only and should also give the parties a schedule to follow during the holidays and provide for blocks of time for vacation during the summer months. Even though the terms of the parenting plan become incorporated into the judgment and are legally binding, the parties are still permitted to deviate from the custody schedule so long as they are in agreement. In the event, the parties are not in agreement on how to deviate from the parenting plan, the parenting plan governs. A thorough parenting plan will also provide guidance for the parents in claiming the child or children on taxes, covering the cost of health insurance, uncovered medical expenses, daycare/childcare, educational expenses, extracurricular activity expenses and college expenses. The terms should set out how the parents keep track of the expenses as well as go about requesting reimbursement for shared expenses. Your family law attorney can advise you in what expenses you should cover and whether or not you are entitled to reimbursement of those expenses. Some jurisdictions provide a template that parties are required to use in creating the parenting plan, but most jurisdictions allow the parties to submit their parenting plan in the format that he or she prefers to use. Some templates are available only online and can be a good tool for getting the conversation started on what sort of parenting plan best suits your family’s needs. You should review any contemplated parenting plan with an attorney before submitting it to the court for approval. Your attorney will ensure that the plan is complete, enforceable and best for you. Child Custody - What Happens to my Kids During the Divorce? If My Spouse Divorces Me, Will I Have the Money to Survive? Our law firm provides legal advice and representation to clients in Jefferson City, MO, throughout the United States, and communities throughout Audrain County, Callaway County, Camden County, Cole County, Cooper County, Boone County, Maries County, Miller County, Moniteau County, Morgan County, Osage County, Pettis County, Phelps County, Randolph County, and all of central Missouri, including the cities of Boonville, Camdenton, Columbia, Fulton, Lake of the Ozarks, Mexico, Rolla and Sedalia.